I’m reviewing the PC version, which again lacks features from the console release, namely the entire MyTEAM mode and Virtual Currency, which is usually used to buy booster packs in MyTEAM and improving your abilities in MyCAREER mode. MyCAREER mode is largely the same as last year’s with two notable exceptions. For one, the game is locked at All-Star difficulty or above, which makes it a good bit harder than last year. Secondly, to my delight they now give you a small scouting report on whoever you’re matched up against whenever your character gets into a game. This isn’t so helpful if you’re facing, say Kobe, Chris Paul or LeBron, since if you’re playing this game you probably know what to expect from them, but for lesser known players and rookies this is a big help. It’s handy to know that, for example, the player you’re guarding is a good perimeter shooter with poor ball handling skills, since you know to play up on them, denying their shot and not have to worry as much about getting beaten off the dribble. Speaking of dribbling, NBA 2K14 takes 2K13’s dribble controls and blends them into the shot stick from 2K12 creating what in theory is a system that can go from pulling off crossovers and behind-the-back moves to detecting that you want to shoot the ball, and often it works well. It’s the times it doesn’t work so well that break the immersion. When I take a shot I don’t intend to while trying to dribble, it’s really irritating. The ball physics seem looser this year, with allot more knockaways and tipped dribbles, not counting batted passes and the revamped shot blocking mechanism. This leads to allot of turnovers both by you and the AI as players’ knees and hips knock careless dribbles loose with reckless abandon. I found that it’s easier while playing help defense to get up on the ball handler really tight on their ball hand while they’re dribbling, and without risking a steal attempt just try to bump the ball free. This works more often then I think it should, but that may just be because I’m used to video game basketball not taking that kind of contact into consideration. Path to Greatness or Road to Ruin? The big ‘tada’ feature this year is the LeBron: Path to Greatness mode, a spoof on the Jordan Challenge mode from NBA 2k11. You guide LeBron through the next few years of his career and can either stick with the Heat (boring) or embark on leave the Heat to go on a fantastic journey though NBA fan-fic land with such oddities as Iverson leading the Sixers back to prominence. It’s a little campy but it’s fun if you don’t take it too seriously. Visually, I honestly can’t tell the difference between NBA 2K14 and last year’s models and textures, but the animations are a huge step up. They just look more fluid and realistic and yet don’t tie you down in long animation chains, allowing for solid controls as well. The commentary is as good as ever, with the fanciful Path to Greatness featuring some fun lines, read earnestly and totally straight about the future hypotheticals it presents. It’s similar to the way the Jordan Challenge mode had custom commentary based around the events from the individual seasons it represented. The UI is functional and less garish then last year’s overall. I want to like this game more than I do. It’s technically better than last year, it has some nice ideas for the controls that are implemented pretty well, and I like some of the smaller improvements allot. I just find the game too punishing of small mistakes and the AI doesn’t seem as balanced as last year, as far as your teammates vs. the other team’s players are concerned. My teammates do allot of standing around without the ball or crowding me (despite pre-release hype about better floor spacing) while the CPU team seems to play a much more balanced team game. This is less of a problem in modes where you can swap characters but in MrCAREER, if your teammates are acting stupid, you’re screwed. That leaves you to try and make up for their shortcomings or watch the losses pile up. This makes improving really hard on PC since you only get points to improve from playing well and as a team player, and that’s hard to do when your teammates dribble the ball in place for 20 seconds of every shot clock. I’ve run through a handful of different MyCAREER players and each team I’ve been on has struggled to play competently. It counts on you making up the difference but since you usually start with a rating below 65, you aren’t very well equipped for this. NBA 2K14 is also buggier than previous releases. My biggest bugaboo is that players tend to walk out of bounds or catch passes standing on the sidelines with regularity. I don’t remember this being a problem at all in 2K13. Also, the new pass stick (hold the left trigger as a modifier and flick the right stick to throw a flashy pass) simply doesn’t work for me. The NBA 2K series has always had issues with passing to who you intend to so I don’t know why they thought this was a good idea. Worse, I’ve had quite a few instances where the pass stick simply won’t respond at all. 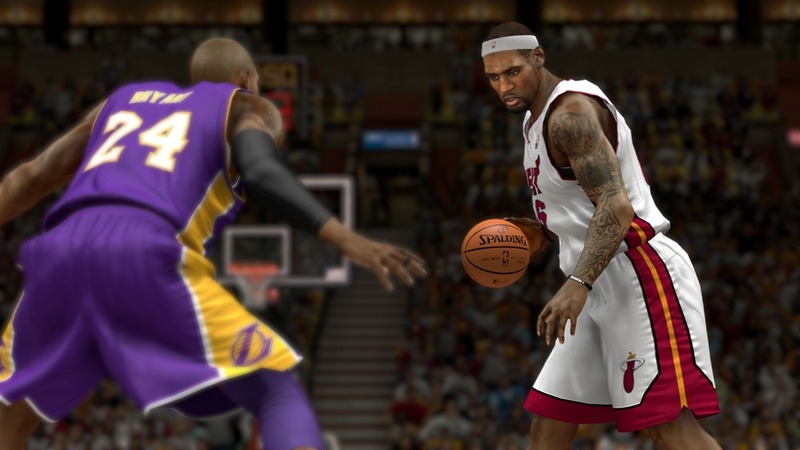 In the end, is NBA 2K14 worth upgrading from 2K13 for? I’d say, yes. For all of its bugs, the new dribble/shot stick is great when it works and the game just feels better on the court than last year. With practice you’ll surmount the steeper difficulty curve, and that’s very satisfying. 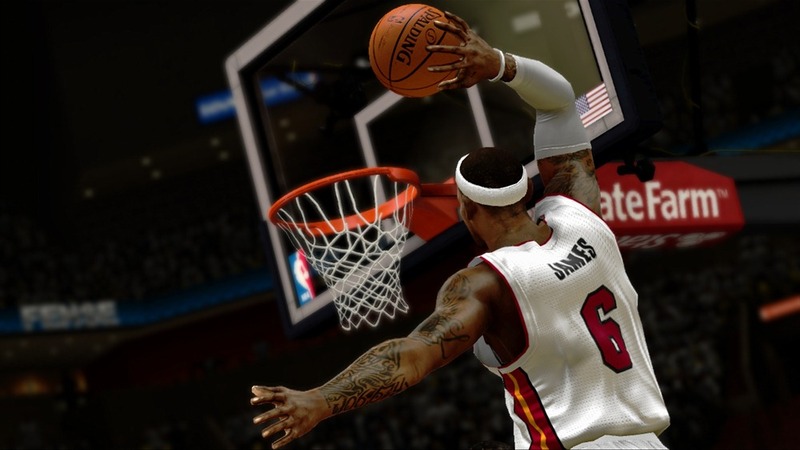 No, LeBron, basketball isn’t easy, and neither is NBA 2K14 – and I’m ok with that.